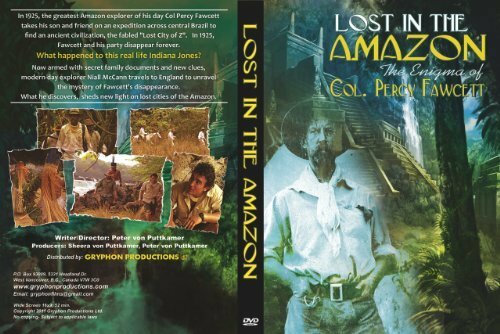 DVD of Lost in the Amazon: The Enigma of Col. Percy Fawcett - in 1925 the greatest Amazon explorer of his day Co Percy Fawcett takes his son on an expedition across Brazil to find an ancient civilization, the fabled Lost City of Z. in 1925 Fawcett and his party disappear forever - What happened to this real life Indiana Jones? Modern day explorer Niall McCann travels to England to unravel the mystery of Fawcett's disappearance. What he discovers, sheds new light on lost cities of the Amazon.